Closing in on the strongest 6×7 rope we produce, this 14mm 6×7 Galvanised Wire Rope example is galvanised for the purpose of providing anti-corrosion properties to the external steel surface while featuring a fibre core for a modicum of malleability in one fell swoop. From moisture in the atmosphere to direct contact with salt water, the wonders of galvanised rope will continue to impress as it resists these problematic environments and stays stable and sturdy almost indefinitely. A heap of different strand configurations using this material are offered here at Rope Services Direct. Choosing between them is a case of weighing the pros and cons that each brings to the table. 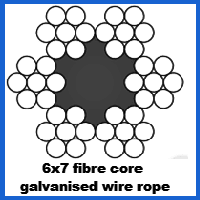 6×7 rope is a little less rigid than 7×7 rope, for example, since it swaps a wire core for a fibre alternative. Load capacities of just over 13 tonnes are boasted by the highest grade example of this 14mm rope, while the 127.5kN minimum breaking force is another indication of its durability. If versatility is what you are looking for, our wire rope products will certainly fit the bill. You can make your galvanised rope go even further towards optimising your operations if you include it in a wire rope assembly that is made to measure at our modern facility. You do not have to use guesswork to get the best wire rope for your needs; just call 01384 78004 or compose an email on our site to let RSD help out. 14mm 6x7 Galvanised Wire Rope Overall rating: 5 out of 5 based on 6 reviews.